Mesothelioma Warrior Heather Von St. James had a lung removed seven years ago when her daughter was only a few months old. Her fears were overwhelming. Would she live to see her child grow up? On the first anniversary of her surgery, she and her husband, Cameron, started Lungleavin Day, a day to let go of our fears and resolve to live life to the fullest. ADAO is a proud participant in Lungleavin Day. For the past seven years, Heather and Cameron have hosted this day in their home, where people write their fears on a plate and throw their plates in the fire. 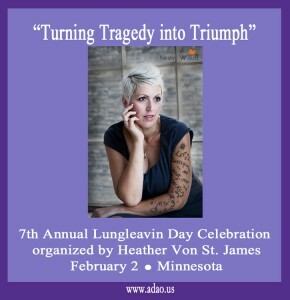 Lungleavin Day has grown from just the two of them to over 75 people in 2012.  This year, Lungleavin Day will be expanded even further by webcast to Mesothelioma Warriors around the world. To join us, please go to Heather’s Facebook fan page on Saturday, February 2 beginning at 6:00 pm Central Time and show your support. Heather will also host a silent auction with proceeds going to three mesothelioma organizations – ADAO, MARF and IMP. Thanks to Barbara Minty McQueen, ADAO will donate an autographed copy of her book Steve McQueen: The Last Mile…Revisited to Heather’s auction. ADAO’s ongoing relationship with Heather includes, “The Value of My Life in Dollars and Tears,” which is her story shared through our “Share Your Story” program, as well as her presentation at our 2011 Asbestos Awareness Conference and her upcoming presentation “Turn Anger into Action” at our 2013 Asbestos Awareness Conference. Thank you, Heather, for your generosity and your tireless support of ADAO. For more about Heather, follow “Heather’s Hope” blog.